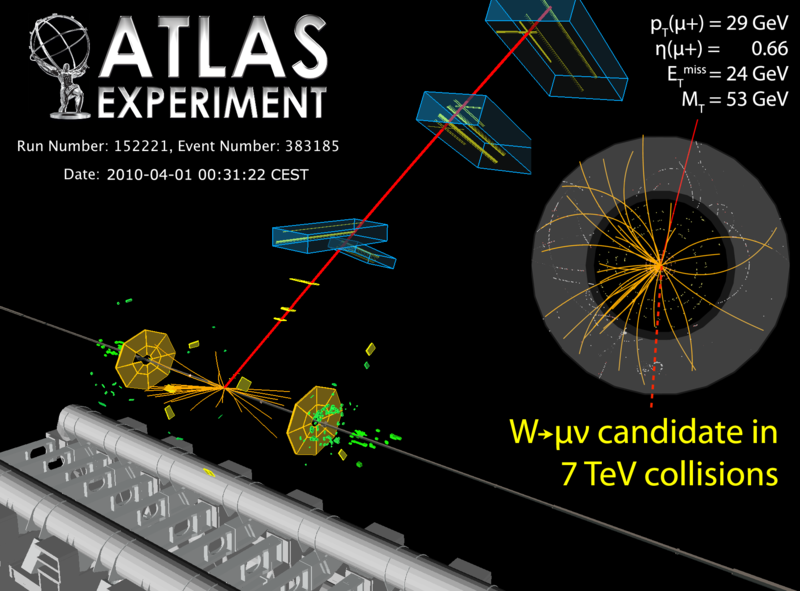 The LHC continues to make physics runs with beam energies of 3.5TeV. Although this is three times as much energy as the Tevatron in the US, we are unlikely to see new physics until the LHC beats the Tevatron on luminosity too. The current luminosity of runs at the LHC is about 1027 cm-1s-1, but the Tevatron is reaching peak luminosities of 3 x 1032 cm-1s-1. That’s an impressive 300,000 times better. These accelerators are looking for the collisions events where new particles are created, but these events are extremely rare. Furthermore, even if the particles are being created they are masked by background processes that mimic their signature in the detectors. The physicists can only know the particles are there when they see significantly more signal than the expected background noise. This means collecting many events and the number of events they can collect is proportional to the luminosity and the length of time they can run the collider for. The higher energy does give the LHC some advantage though. For most processes they want to see the number of events seen is likely to be something like ten to a hundred times higher at 3.5TeV than at 1 TeV. That still leaves the LHC a long way short of the Tevatron, for now. Luckily the design luminosity of the LHC is much higher than what they are currently running it at. In fact it should be able to reach luminosities of 1034 cm-1s-1. That’s 30 times what the Tevatron runs at. But to reach this energy the collider operators have a lot of work to do. They need to gain seven orders of magnitude more luminosity. To achieve this they have three main tactics and already we have seen them testing out some of these over the last few days. The first trick is to “squeeze” the beams by focusing them with magnets as they pass through the detectors. The amount of squeeze of measured by a parameter called beta which starts out at 11 meters. Last week they were able to squeeze this down to 2 meters, but the target is to get it down to 0.5 meters. When they do this the beam becomes much narrower so they have so control its position more carefully, otherwise the tight beams will miss each other completely and there will be no collisions at all. If they get it right they stand to gain a factor of up to about 20 using this method. The second trick is much simpler. They just put more protons in each bunch. For the physics runs they have been doing this month they have been putting about 10 billion protons in each bunch, but last night they ran some trial injections gradually increasing the number up to 100 billion. That’s another factor of 10 in luminosity for each beam ready to be tapped, or 100 overall. The final step is to increase the number of bunches circulating round the collider ring. They are currently circulating 2 bunched in each direction but each detector is seeing just the collisions from one bunch in each beam. Last year they were able to circulate 16 bunches in each beam but the design limit is 2808 bunches, so there is another factor of nearly 3000 to be gained. Overall that makes a potential increase of 20x100x3000 = 6000000 times the current luminosity. When they reach that point the work of several weeks of running at the current luminosities will be done in a fraction of a second. Obviously they will want to get to these higher luminosities as soon as possible, but they have to be careful. At present luminosities the beams are relatively safe and if they make a mistake that sends the beam into the collimators there is not too much damage. At the higher luminosities an error could send particles flying in all directions causing serious damage to the detectors. So hopefully they will increase the luminosity carefully, but not too slowly. In the meantime the detectors are rediscovering known physics. One of the latest candidate events is this W to muon from last week. Soon they should also rediscover the Z, then as the luminosity goes up they should start to collect top quark events for the first time in Europe. The Higgs and other new physics will have to wait for better luminosity, unless of course there is something unexpectedly easy to see at 7 TeV. This entry was posted on Saturday, April 10th, 2010 at 11:30 am and is filed under Large Hadron Collider. You can follow any responses to this entry through the RSS 2.0 feed. Both comments and pings are currently closed. Thanks for the corrections, I’ll fix the original.